This musi­cal is about two sis­ters who embark on a quest to find their miss­ing aunt, who they only recent­ly learned about. This is a large musi­cal pro­duc­tion with a full cast, set and elab­o­rate cos­tumes. The tale itself is inter­est­ing and holds the audience’s atten­tion, although I felt it could have be tight­ened up and been a bit short­er. 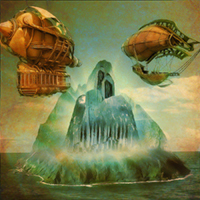 The sto­ry is set in a mys­ti­cal steam­punk fan­ta­sy world where the two sis­ters must jour­ney by bike, train, boat, and land to for­eign places filled with goons, hos­tile locals, pirates, and a mad sci­en­tist to search for fam­i­ly, knowl­edge, and self-iden­ti­ty. The per­for­mances are good, the songs ener­getic and the pro­duc­tion well rehearsed. It’s a fun and enjoy­able jour­ney that is worth check­ing out.